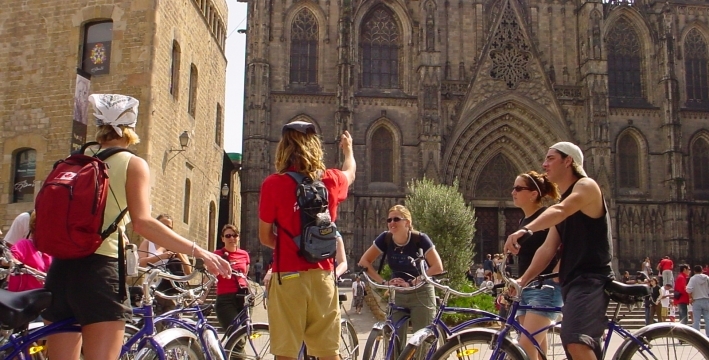 Exploring Barcelona on two wheels can be a great way to see the city. It’s fast, convenient and not to mention great fun! The Catalan capital offers a range of cycle services, for both locals and visitors, from bike rentals to completely guided cycle tours. Here are some of our favourite bike rental and tour companies in Barcelona, to make your stay just that little more exciting! Situated in the Raval neighbourhood, Ajo Bike is perfect for those looking to explore the city at their own pace. 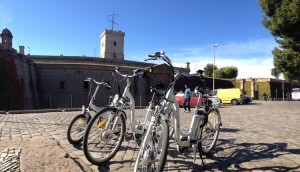 You can rent a bike from as little as 4€ and see what Barcelona has to offer on your own terms. They also offer private group tours for groups of friends, guided by an expert through the city, you can expect to see Barcelona’s hidden corners and its most famous sights. Steel Donkey Tours offer a great experience to discover Barcelona’s hidden gems, away from the hustle and bustle of Barcelona’s busiest areas! You could find yourself sampling the best patatas bravas in Barcelona, exploring unique attractions such as the Hospital de la Santa Creu i Sant Pau and maybe even stopping off for a game of ping pong on the way to the beach! Each and every tour promises to be different as Steel Donkey Tours cater their tours to each individual group. See Barcelona’s captivating sights and explore its history on two wheels at the hands of an expert guide, exploring all the main attractions and more. Fat Tire guides really know their stuff! There are plenty of stops along the tour, meaning people of all ages and cycling abilities are welcome. If you can ride a bike, you’re in! 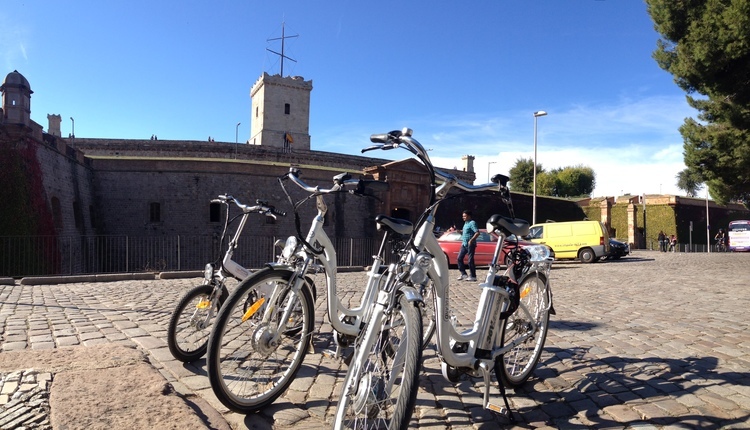 Green Bikes offer both group tours and private tours throughout the city. Explore some of Barcelona’s top sights, such as the Gothic quarter and Barceloneta Beach, at the hands (or wheels) of a local guide. The company has guides in a number of languages including English, Dutch, Spanish, German and Italian! Bring the kids along too, helmets and child seats are free! For those who love adventure, why not explore the Collserola and Garraf Massif Mountains surrounding Barcelona? There are a number of bike tours operating through the mountains, perfect for any nature lovers or adventure seekers! Terra Diversions provide a number of trips for different abilities that can be taken individually, as part of a group or in the company of a multilingual guide. Cyclists with Terra Diversions receive daily sports insurance along with free water and snacks to keep you going! Another fantastic way to see the city is cycling around Montjuïc hill, where you can expect to enjoy spectacular views over the city as well as some great sights such as Montjuïc Castle and the Olympic stadium. After, we recommend heading to Plaça Espanya for some more sightseeing, taking Avinguda Paral-lel towards the Port Vell and Columbus statue! Barcelona is currently ranked as seventeenth in terms of bike-friendly cities and is constantly striving to improve upon this. Recent adjustments include speed limits, compulsory use of helmets, traffic lights for cyclists and allowing bike access to metro stations and other modes of transport around the city. AB Apartment Barcelona is a leading apartment rental company based in Barcelona. They have over 900 Barcelona apartments to rent for short and long term stays, as well as apartments for sale. 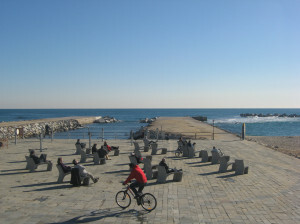 This entry was posted in Activities, Home, Tourist Guide and tagged barcelona, barcelona tourist guide, barcelona tours, bike tours barcelona, travelling around barcelona. Bookmark the permalink.